Between 1973 and 1982, the National Coal Board′s North East Area ordered twenty 400hp 0-6-0DH locos from Andrew Barclay, Sons & Co Ltd, of Kilmarnock in Ayrshire. These had Rolls-Royce C8TFL engines and weighed 52Tons. Andrew Barclay 615 was ex-works on 30/3/1977 to Bates Colliery in Northumberland and carried the plant number 20/110/711. Following work at Bates Colliery, in May 1983, she was sent to Lambton Engine Works at Philadelphia, Tyne & Wear for overhaul, following which she was moved in October 1983 to South Hetton Railways in County Durham. After the 1984/85 Miners Strike, she returned to Lambton Engine Works in June 1985. In September 1985, she was sent to Whittle Colliery in Northumberland, where she worked the steeply graded branch to the East Coast Main Line. She was sent back to her builders in March 1987, who rebuilt her under order 6719/1987 and returned her to Ellington South loco shed in Northumberland in February 1988. Ellington was privatised at the end of 1994 and her new owners were RJB Mining (UK) Ltd. They moved her to their Gascoigne Wood Colliery in North Yorkshire in February 1996, where she was used to shunt crippled HAA wagons and was the last working shunting loco at a UK colliery. In February 2005, she moved to the Tanfield Railway for preservation, before being loaned out on long term hire to Ribble Rail at Preston, Lancs in September 2007. Ribble Rail is the commercial arm of Ribble Steam Railway and here, she was used to take over loads of 100 Ton Bitumen bogie tankers from DB Shenker Rail and move them to the Total plant in Preston Docks, three times a week. 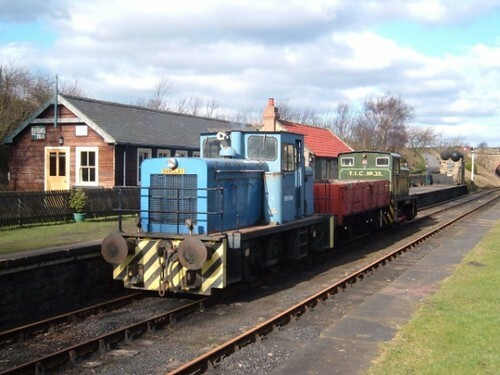 615 left Ribble Rail in 2012 and is currently on the AVR, she will return to the Tanfield Railway in due course.